Just as He was about to get taken and put in prison then tortured and hung on the cross Jesus spoke to His followers about peace. He forewarned them that there would be all kinds of crazy stuff gong on in the future and that they were not to worry about that because He had already taken care of it. He told them to have peace, not as the world gives but peace that passes all understanding to the point of understanding the unbelievable and believable. He did not just tell them to have peace but Jesus gave it and left it with them. He left it with a stipulation; that we obey His commands, or His teaching. We need to obey God to have peace. And that’s nor really such a big deal, obedience is easy when it is someone you love. It is no different today if we want to have a peaceful life we have to be sure we are keeping God’s Word in our heart and obeying His Word as well. It proves that we love Him and I believe it also makes God want to bless us in the same way we want to bless our children when they obey us. I love this chapter of John because it gives us so much to think on each day. Jesus was winding down his time on earth and about to be captured and hung on the cross for us; He gave us such meat and such dessert! The meat is the ‘get your heart and mind right with God through His Word’; the dessert is the peace, joy, and love going on in our lives! We receive the blessing of dessert when we have completed our meals as children, so why not as children of God? It all makes such sense! Looking back at verse fifteen we can see that God wants to be part of our lives forever, but again we must keep the peace between us with the obedience in His Word. Another cool thing in this chapter that stands out to me is that we are one; one with the Father, Son, and Holy Spirit. We are one church, throughout the world, full of many denominations but one through Christ! It is funny cause so many people want to see God, as a child my sister an I got part of that concept a little off as we would try to figure God out. 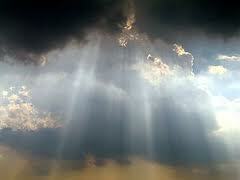 We had heard that God was with us, and in us. So we found that funny, we would say something and say hey if God is in us then God just talked! We had no clue then but we know the difference now. We were not so far off because the Holy Spirit within us is whom we are representing when we speak. So when we talk, God is sharing with our words. 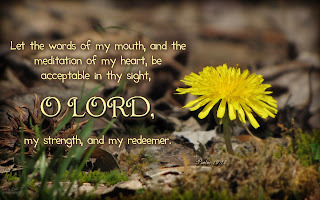 Let the words of my mouth and the thoughts of my heart be accepted in Your sight oh Lord. For when I speak, the words I speak are to be filtered through Christ. I fall short sometimes; I confess when I am frustrated I am not always tempered with peace; I forget that I have joy within me with just a simple prayer and I sometimes say words I wish I had never heard from anyone come out of my mouth. Don’t let your imagination run wild; know that the rotten stinky words I have used are not too bad compared to others, but I know they are not acceptable in His sight I am ashamed to say. So what do we do when a word comes out that we may have heard someone say in the world, what do we do then? We pray and ask God to forgive us and whoever was in our midst as we muttered those words. I want only good to come out of me, but occasionally that which we hear is what will come out. So lets make it a pack to not use words that produce bad feelings but only good; lets decide to dig in the Word more so that we can be one with Christ always and not speak out in words of anger, but that our utterances will be full of prayer for peace, hope, love, and joy. I know my God is with me wherever I go, and that means that even if a word or a thought slips out I am bringing it to Him, because we are one with Jesus via the Holy Spirit. I cannot deny Christ just because I am walking around in an unholy world. We need to live by bigger standards than the people who do not know Christ. He did not come just to bring us peace, but He does give us peace. If we work to keep our hearts and minds clean before the Lord then our mind will be stayed on Him, and He will keep in perfect peace whose mind is stayed on Him! Isaiah 26:3 paraphrased. Dear Heavenly Father, forgive us for not keeping our minds clean before you. Help us to remember that we are one with You and that all it takes is a moment of remembering to clear out the unacceptable thoughts and words, help us to remain in You from start to finish of each day as we think in Your Word. In Jesus name, amen.